I was somewhat surprised to learn that Brian Michael Bendis would be taking over Marvel's Iron Man comic post-Secret Wars. He was just wrapping up his run on the X-Men franchise (writing both All-New X-Men and Ucanny X-Men), he had spent years on The Avengers franchise (and can probably claim a lot of credit for the Avengers essentially replacing the X-Men in Marvel's sales heirarchy) and has dabbled with minor characters (Moon Knight, Spider-Woman) and creator-owned stuff of little market interest (Brilliant, Scarlet). When he started at Marvel--what, like 65 years ago now?--he established himself on street-level crime comics (Daredevil, Alias) and on the Ultimate imprint (Every issue of Ultimate Spider-Man ever, Ultimate Marvel Team-Up, a run on Ultimate X-Men, etc). Add to that the fact that he's written about every other of Marvel's big event series and, well, there wasn't really anywhere for Bendis to go, really. Aside from maybe making the jump from Ultimate Spider-Men to the "real" Spider-Man of Amazing Spider-Man (which I imagine wouldn't be either much fun or much of a challenge for Bendis after having written other versions of Spider-Man for so long), or trying his hand at rehabilitating the Fantastic Four (an apparently impossible task, based on the fact that Marvel let Jonathan Hickman essentially retire the concept from the marvel Universe during Secret Wars), Bendis has written pretty much everything at this point. So Invincible Iron Man? That was a bit of a surprise, as it was neither an attempt to turn a character, concept or franchise around, as he's spent so much of his career at Marvel doing, or hop on a luctrative bandwagon, which he has more infrequently done (Guardians of the Galaxy, the first story arc of the 2012-launched Avengers Assemble). And, of course, Bendis has already spent a lot of time writing the character in his various Avengers books and event stories. I was more surprised still to learn that Bendis' first few issues of Invincible Iron Man, with artist David Marquez, were good. 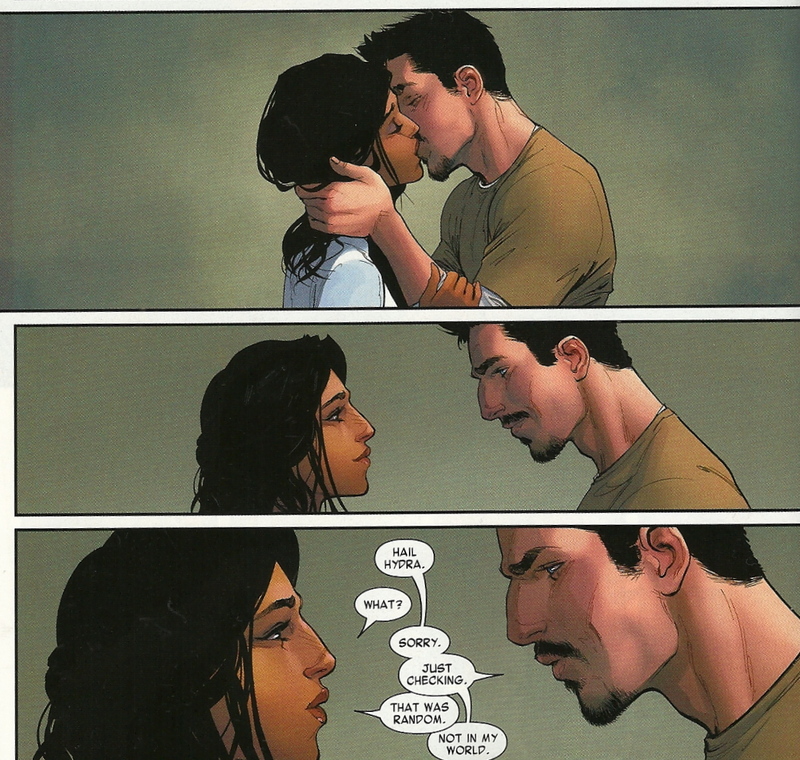 Between Hickman's use of Iron Man in his Avengers and, especially, his New Avengers and Rick Remender's "inversion" of the character as part of Axis (which lead to The Superior Iron Man), the character has been through a lot lately, and more-or-less forced back into his Captain America-fighting, Machiavellian plotter characterization from Civil War, by virtue of being one of the Marvel Universe's smart guys (the rest of the geniuses, from Mister Fantastic to the Black Panther to Beast, have similarly been engaged in morally dubious activities for the years that Hickman was writing the Avengers). Bendis, wisely, ignores the baggage; he's writing a new #1 after all, and if Secret Wars didn't provide the sort of hard reboot of a DC Comics cosmological event, but it changed a few things, and certainly gave creators some wiggle room here or there if they felt like taking it (Bendis is apparently inheriting one of the characters most changed by Secret Wars to use as a foil to his Iron Man). 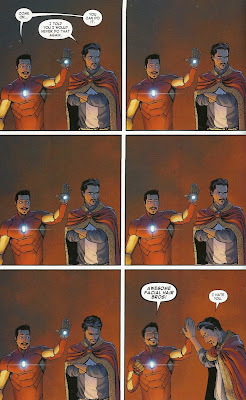 Bendis and Marquez give Tony Stark the requisite new set of armor, this one. This is actually a pretty inspired take on Iron Man's armor, as it's an armor than can transform into any and all of his other suits of armor, as needed. I don't know the science of it, and I don't think Bendis even attempts to explain it in the way, say, Warren Ellis might have, but it's cool. They also give him someone to talk to in the form of Friday, a pre-programmed voice in his head, a sort of pink-holographic replacement for Pepper Potts (or the Jarvis AI of the Cinematic Universe); it's the Iron Man version of Siri, basically. The villain for the first story arc is Whitney Frost, AKA Madame Masque, last seen menacing Lady Hawkguy in the pages of Matt Fraction and company's volume of Hawkeye (or maybe you saw a version of her on the second season of Agent Carter...? I like that show. I hope there's a third season). Marquez has redesigned her mask to make it at once more creepy and more ornate, but she otherwise looks the same. She's taken to stealing objects of great magical power, for reasons that will be explained by volume's end, and one such item she steals from Doctor Victor Von Doom. Doom's given up his boss mask, hood and cape for a pretty lame suit and tie look, on account of the fact that Reed Richards fixed his face when un-making Battleworld and re-making the Marvel Universe in Secret Wars (Um, spoiler alert?). While Doom isn't using any mechanical might, he is still using his mystical might, and he kinda sorta enters into an alliance with Stark to help track and capture Frost...especially since Doctor Strange isn't always available. 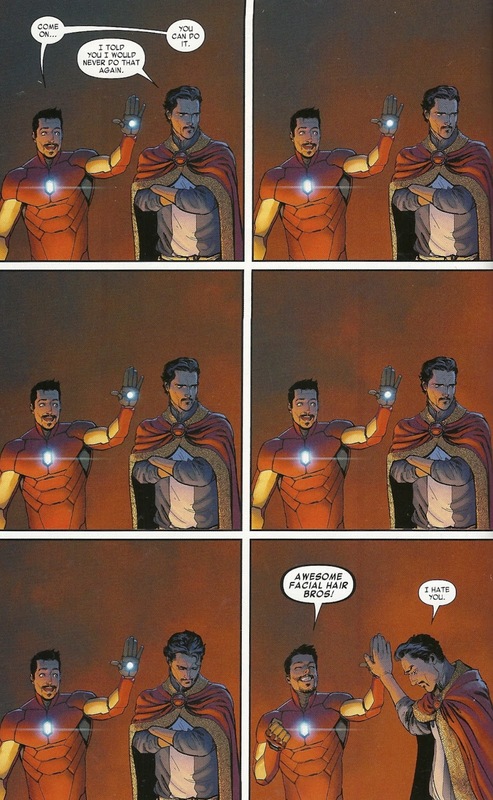 Bendis' particular portrayal of Stark seems heavily inspired by Robert Downey Jr.'s performance; this Tony Stark if charming, fun and funny, and a rather far cry from the arrogant and agonizing version that we've spent so much time with over the last decade or so. I'm not entirely sure where Bendis will take the title and the character next, as adding Spider-Man's MJ to the cast and The Fantastic Four's Doctor Doom are both unlikely moves on their own, let alone together, and I know Bendis has since launched a second Iron Man title, International Iron Man. What's in this volume, however, is very good and, better still, surprisingly good. 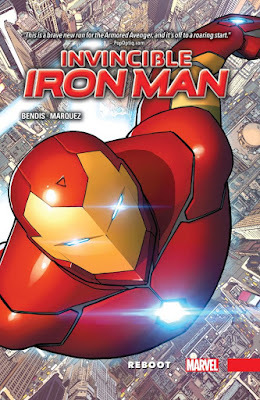 I'd definitely recommend it, and while I don't this particular Invincible Iron Man Vol. 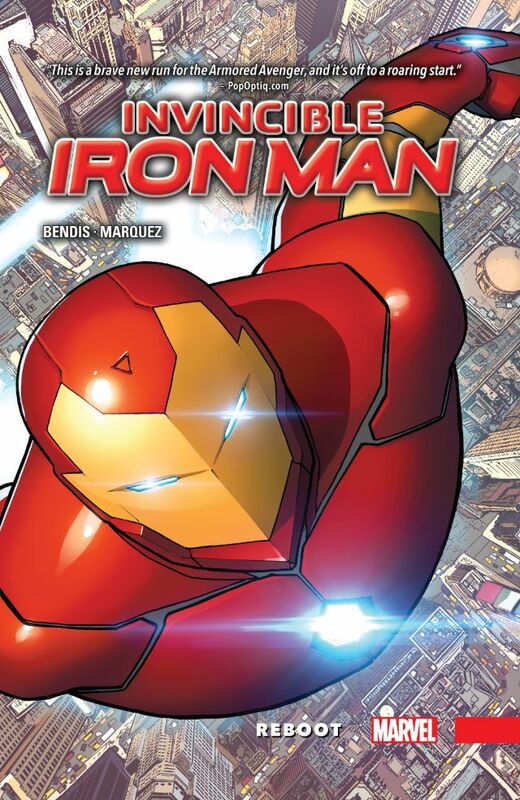 1 is quite as good as the last Invincible Iron Man Vol. 1 (the one written by Matt Fraction and drawn by Salvador Larroca and sub-titled The Five Nightmares), it's at least as, if not more, fun, and, thanks to Marquez, infinitely better-looking. I think that the misremembering of MJ (and later of details about Peter) aren't about changes to Spider-man, per se. Rather, I think that Bendis's is the rare writer using Fraction's conceit that Stark erased his own mind and reloaded his memories from a backup made about a year before Civil War. He simply doesn't remember his own social life in that time, as if under a global amnesia.